Stolen has all the ingredients for a great heist film. Nicolas Cage plays Will Montgomery, a master thief whose last attempt at stealing $10 million from a bank vault went so stunningly well that if not for a series of unfortunate events immediately after the heist — none of which would suggest a competent police force headed by Danny Huston or incompetence on the part of Will's team that resulted in his capture — though the rest of the gang got away. Eight years later, Will is out of the slammer and a vengeful former accomplice as well as a distrusting New Orleans police force want that $10 million. 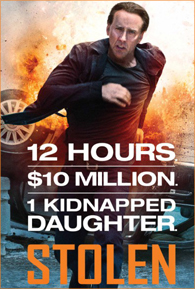 What's a master thief got to do when his daughter is kidnapped, the police won't believe him, and everyone wants that $10 million which doesn't exist because he burnt it before getting captured — except rob a bank? As far as heist films go, Stolen is a competent product telling the age-old story of an ex-con forced by circumstances to return to criminal life. It even throws in the standard heist film tropes about honour and solidarity among thieves, and the consequences of breaking that code of honour. The kidnapping sub-plot is even brilliant as it involves stolen identities, misdirection, and a long chase sequence in a Mardi Gras parade in New Orleans. Hell, even Josh Lucas as the mentally unhinged and very vengeful former accomplice and now extortionist-kidnapper manages to out-crazy Nic Cage and steal every scene they're both in. As far as its premise and concepts go, Stolen should clear the bar easily as a B-film. Its Achilles' heel though happens to be its script, which just lacks that extra little something in it to take Stolen to B-movie greatness, and instead has that little bit of mediocrity to diminish the film into an unimaginative crime thriller filled with the requisite number of car stunts, loud action set pieces, and an unnecessary fire-breathing showdown that feels out of place given the heist genre and the film's buildup. Going straight to DVD in many countries in the coming weeks, Stolen is still a watchable Nicolas Cage film that's entertaining enough if you don't mind its flaws.